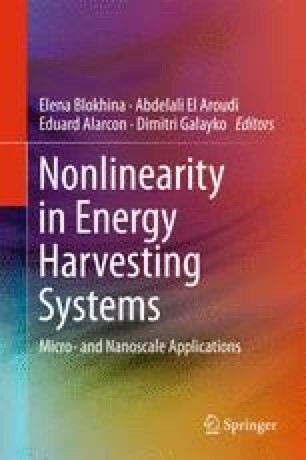 The aim of this chapter is to briefly explain fundamental concepts such as linear and nonlinear oscillators and transducers since they are required for understanding the energy harvesting principle. We discuss the model of free and harmonically driven linear and nonlinear oscillators. In particular, we show that the solution of a forced linear oscillator is a harmonic oscillation at the frequency of the external signal. We discuss the principles of nonlinear oscillators, resonance in nonlinear oscillator and multistability. In order to use an oscillator for the energy harvesting process, one requires a transducer, a device that takes power from one domain (for instance, the mechanical domain) and converts it to another domain (for instance, the electrical domain). In this chapter, we discuss the two most suitable transducers for micro- and nanoscale harvesting—piezoelectric and electrostatic transducers. According to the Green-Riemann theorem , this integral is zero. Riley, K., Hobson, P., & Bence, S. (2006). Mathematical methods for physics and engineering: a comprehensive guide. Cambridge University Press. http://books.google.com.ua/books?id=Mq1nlEKhNcsC.